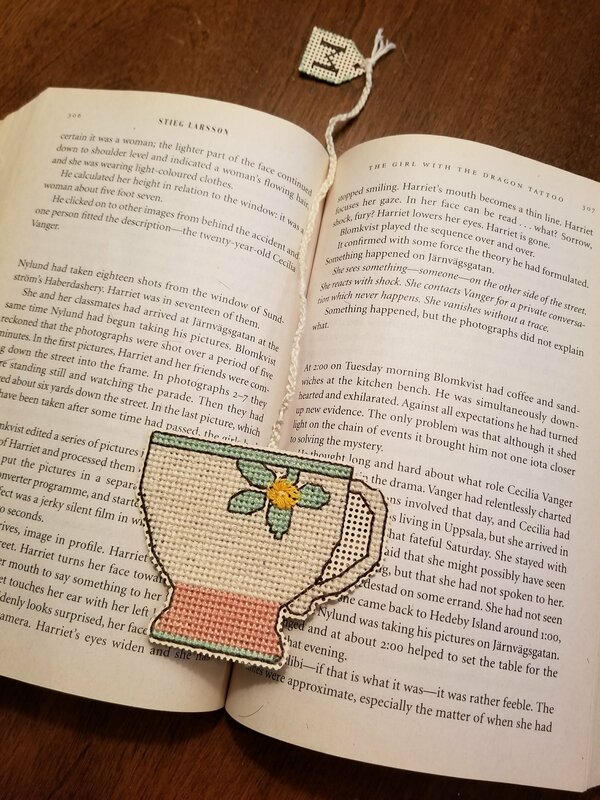 This time of year is very tough for me to get much stitching done because I am a baker. Yesterday was a 10-1/2 hour day and it will only get worse as the weeks leading up to Christmas get closer. Throw my son’s and husband’s work schedules and basketball schedule in there and well…you know what I mean. I worked on this project for about a week. I finished most of the first onion but for some reason was obsessed with finishing the black negative space of the project. Our Next Update is New Year’s Eve I believe (my son’s 16th birthday :)) I hope you all have a happy Christmas! And here is where I am as of today. The onion is almost done. Another onion goes to the left of the gourd too. I may not get much done until after the new year with work and Christmas. But what’s really exciting is on Friday my son and I went thrifting at the Goodwill and I can’t believe what I found. There were eight Rubbermaid plastic boxes filled with envelopes on the shelf I was looking at. It took me a second to realize what was inside but when I saw a skein of embroidery floss and the numbers on the envelopes I bought three out of the eight boxes. Each box was $9.99. 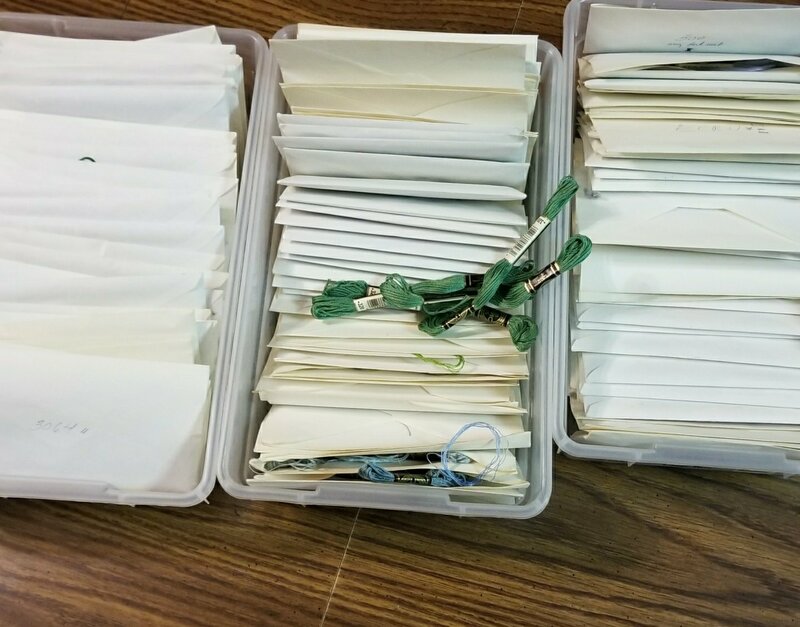 When I got home every one of the envelopes was filled with brand new skeins of floss. There were 305 in total! What a find! Now I want to go back and buy the other five boxes. You just never know what you are going to find while out thrifting. It’s been three weeks since my first update on my new project. 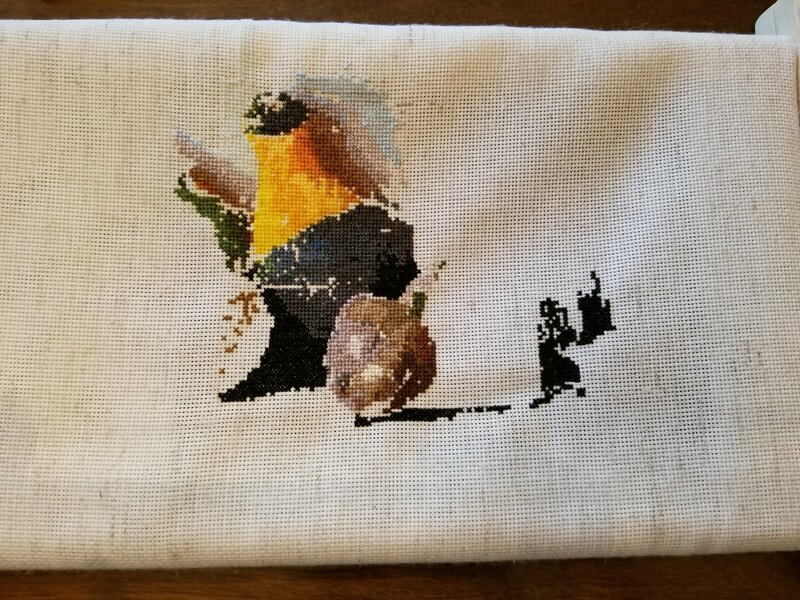 Project Onions and Gourds is a gigantic stitching dream for me. My largest yet. Ten pages to be exact. I got a lot done! Hopefully by next time I will have a couple of onions done! 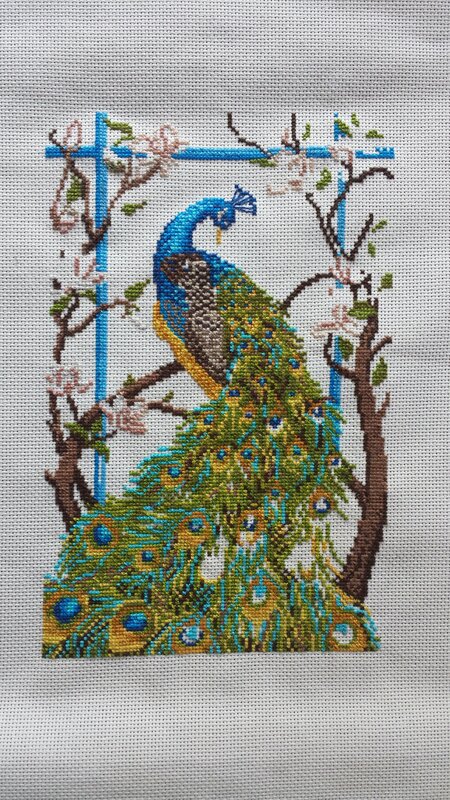 Please visit the other stitchers in our group to see what they are up to. I promise, you will be impressed by their beautiful work! See you in another three weeks. The last 3 weeks have gone by so fast and we have been so busy I only have worked on Salvador for a couple of hours. Sad I know but it is summer here in the US and busy is the name of the game for about another 2 months. 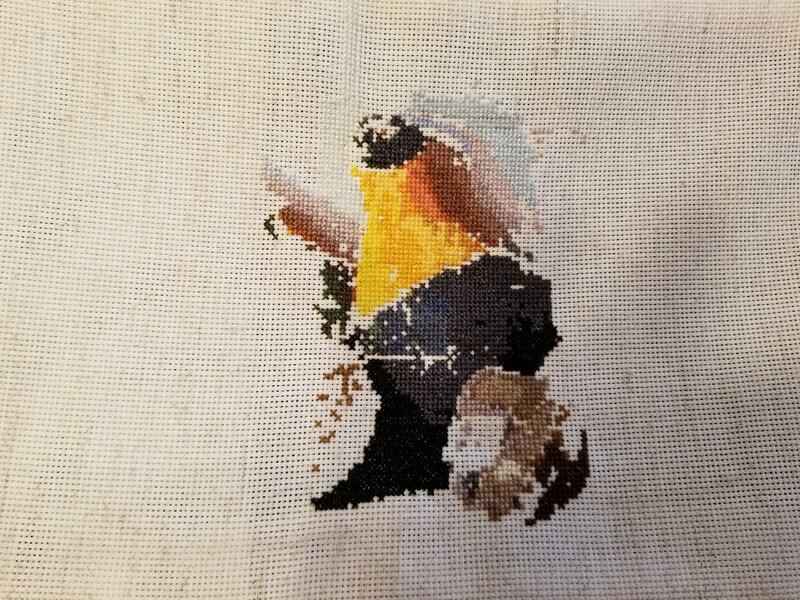 I am slow finishing this project because all of the fun colors are done and I am left with the super light browns and creams and whites which are very unexciting. I don’t know if you can see much of a difference but I did finish 3 more colors completely. 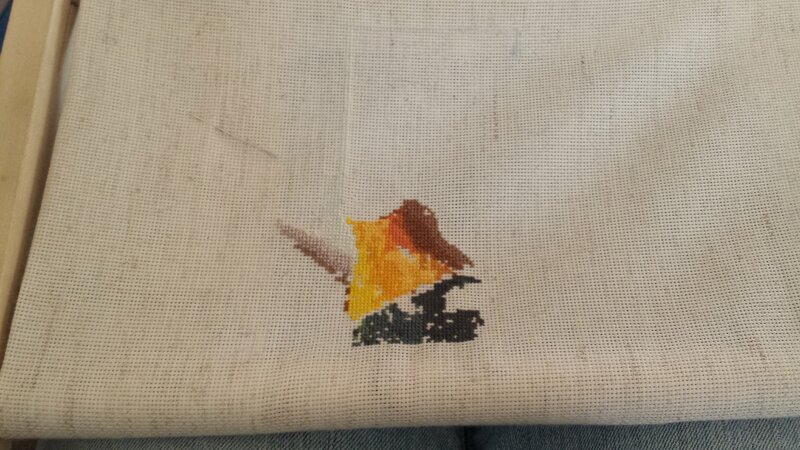 There is back stitching to do too. I have to admit I did start a new project and that took some of my SAL time. 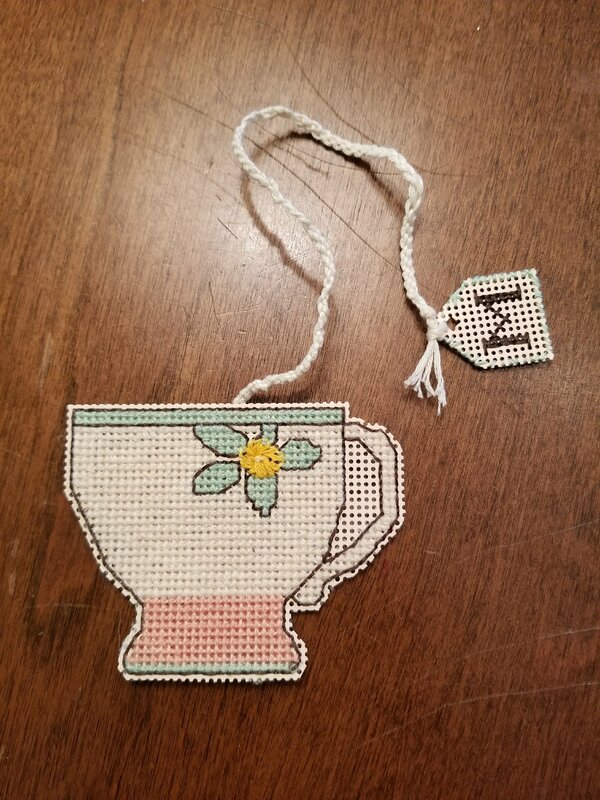 I am learning to design my own cross-stitch designs and charts. For those of you that design your own I admire you greatly. It’s hard work and I have already modified and ripped a bunch of stitches out and restitched. It takes patience but I am loving it so far! 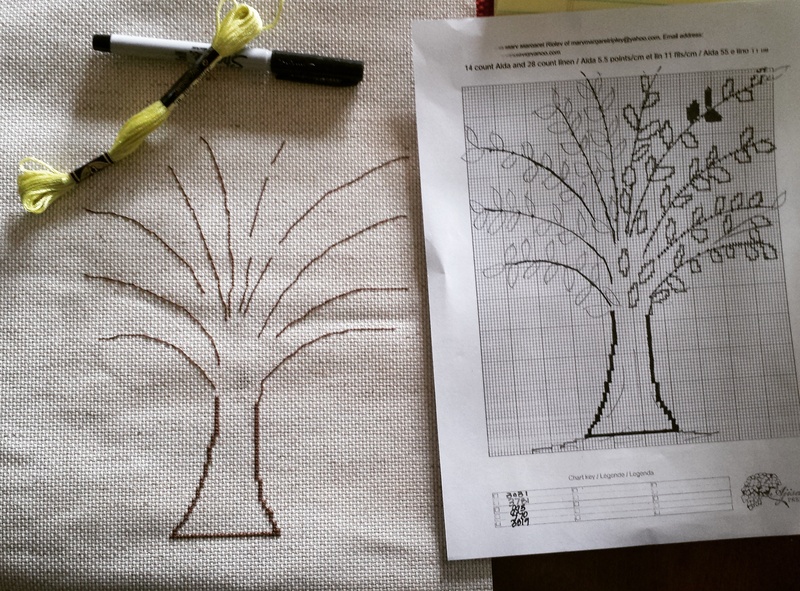 It’s going to be an autumn tree with some sort of saying whether a Biblical quote or something else. Lots of red and orange and yellow leaves. I have already modified and ripped out the trunk once. The members of the wonderful SAL group I am part of are doing some pretty spectacular projects. Click on the links of names below to visit their blogs and see what they are working on! Three weeks ago I was struggling with having to rip a section of my project out because if I didn’t, it would look “off”. After ripping out the bottom of the tree branch on the right side I have successfully stitched it back into place. 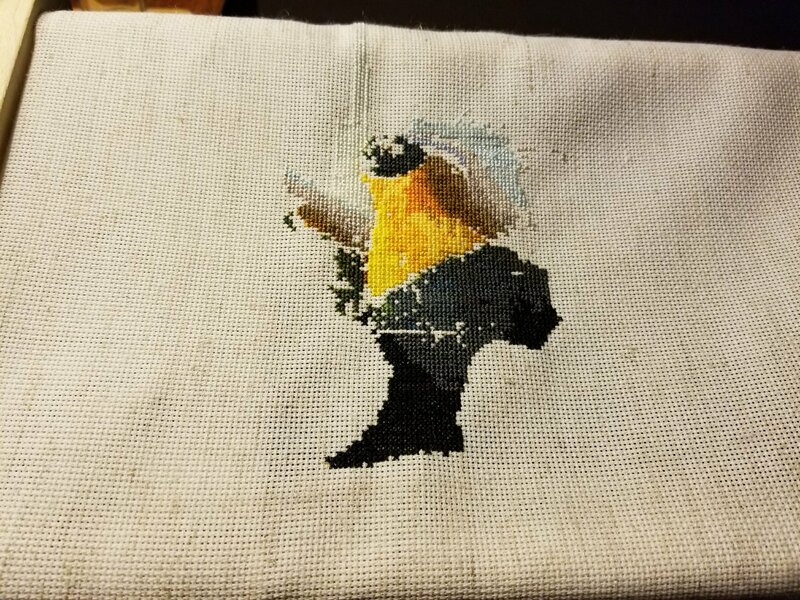 Unfortunately I was again tired the other night, (I know, I know) and I stitched the wrong damn color for one of the shades of yellow. 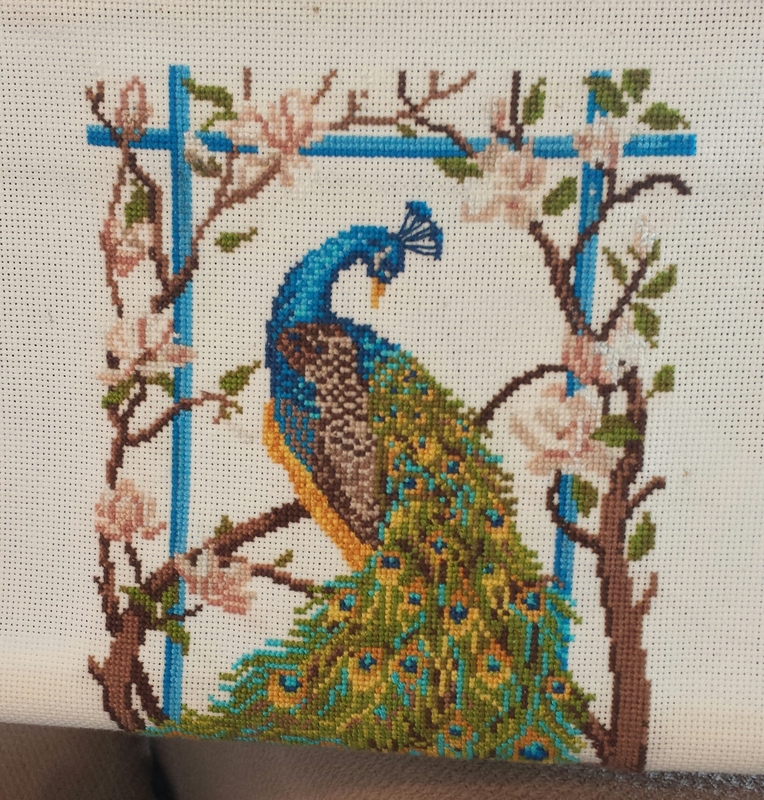 Sigh…I think I am going to leave it this time though and keep stitching. 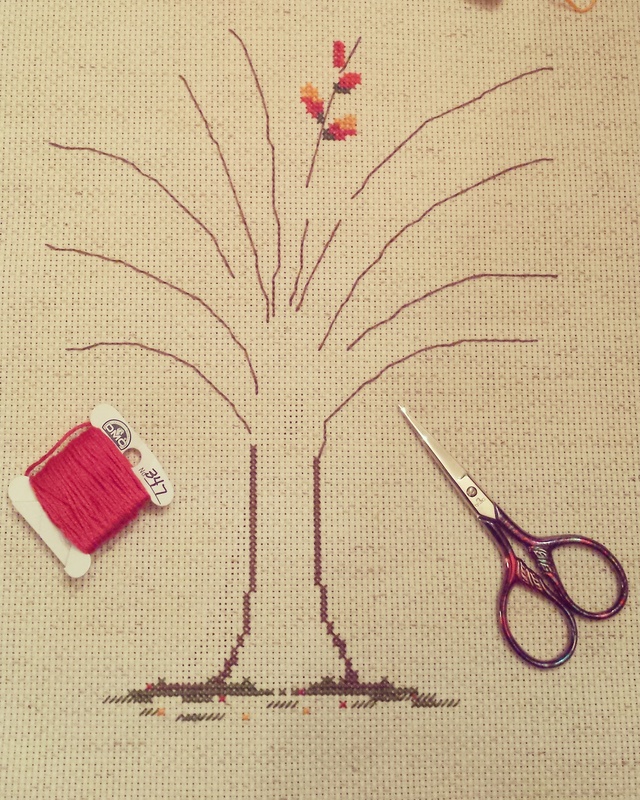 Must not stitch when tired…must not stitch when tired. I would love for you to check out what the other members of the SAL are up to. Just click on the name links below and prepare to be amazed by the quality of work that is going on with the members of this fine group. 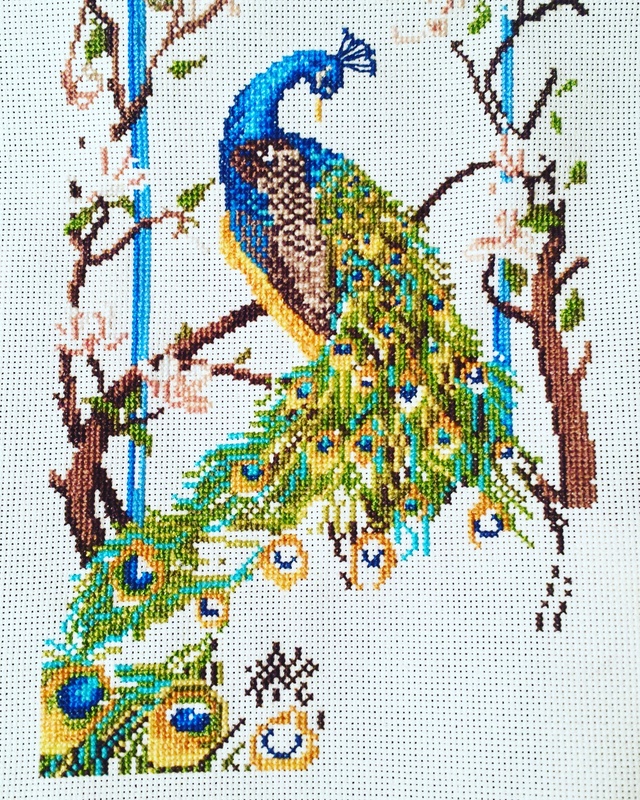 It’s been three weeks since my last post on my Peacock friend and also since I joined a lovely group of ladies (and gentleman :)) in their Stitch-A-Long Group (SAL). 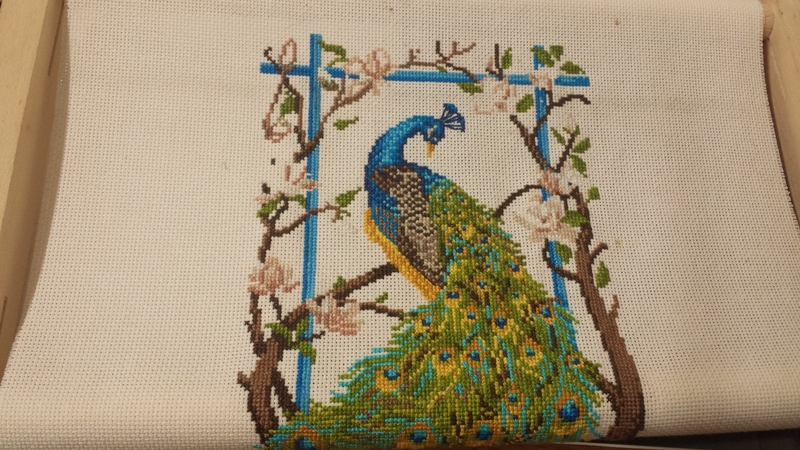 I have gotten a lot done mostly on its tail feathers but also some on the side branches. The top has not changed so I concentrated on showing you the bottom. I still don’t know if this peacock is a boy or girl. Aren’t the boys the pretty ones and the girls the plain ones so they don’t draw attention from predators? I need some help on this. Please check out the other SAL member’s blogs by clicking on the links below. They are doing some fantastic work! If you are interested in joining the group please contact Avis who is the very first link.